It's really hard to find some tasty Cajun food down in OC. Many people recommend Ritter's for their pan roast but I think they are only okay. In fact I even went back to Oysters at Palace Station recently and it was only so-so. I waited in line for 2 hrs at 4am in the morning and it wasn't worth the wait. Ms. Lin Guide was not happy about waiting for the food. While I was waiting around for a friend, I happened to stumble upon Kettlebar, which just opened up at The District in Union Market. The entrance was a little hard to find but eventually we were able to maneuver our way around to it. We had a quick stroll at least inside the Union Market. They are hoping to make it similar to The Anaheim Packing District but far from it. Hopefully it will eventually be as full of good food and fun. A friend recommended the Calamari with sweet ink. The batter was light but I didn't really like the sweet ink. It was just so-so in flavor. Nothing different from your typical sweet and sour sauce. They only drizzle it on the side so there really isn't much sauce for you to actually dip in, which left the dish a little bland and flat. I wanted to try the Wagyu Beef Sliders. The sliders were very tender and flavorful. There is only two tiny bites for $8. Kind of pricey in my book but at least the flavor and quality was good. 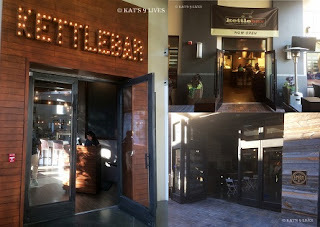 The main reason for coming was to try the Kettlebar Pan Roast. Since there was a few of us, we got some variety to try. The pan roast is made in a tomato cream base with snow crab, lobster, shrimp, chicken and topped with white rice. We got it medium spicy. I wanted spicy but my friends were a little skeptical. This was definitely one of the better pan roasts I have had. It was full of flavor and had an extra kick. One order is definitely enough for two people or two meals. To my surprise, I really enjoyed the Seafood Diablo. It comes with mussels, clams, shrimps, and capers mixed in a linguini. The flavors were immense and with a kick. They use a generous amount of seafood in their dishes. We all agreed that this was probably the best main dish. Both were great to dip your buttered french bread in. The server forgot to give us the bread until the end, which was one of the best parts! Another reason I wanted to come here was to try their Beignets. I am always looking for a traditional beignets. Here, not so much. They are like mini pillows accompanied by a nutella and banana sauce. The sauce is good and the beignets were decent, but nothing too special. I would recommend you to try it for fun but not something I would order again. All in all I liked the food and the portions are pretty big. Hence, I took Ms. Lin Guide back when we went to The Anaheim Packing District. I hope they keep the flavorfulness consistent because I liked this location a lot more.